Sleep, while important for parents, is absolutely essential for healthy babies, and safe sleep should be a high priority for parents whether they are raising their first child or their fifth. 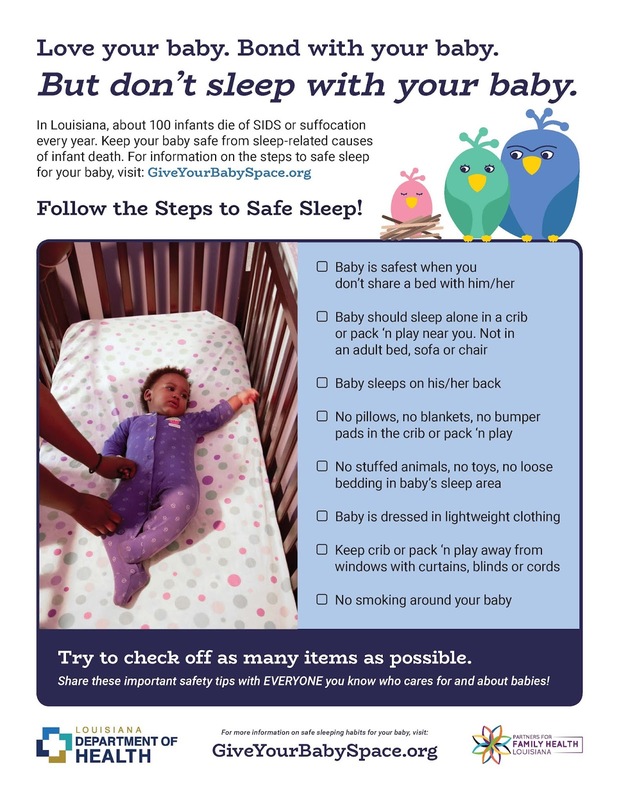 Establishing a safe sleep environment for your baby can be a matter of life or death. Every year in Louisiana, there are about 100 sleep-related infant deaths. That’s the equivalent of five kindergarten classrooms. Although some of those deaths are classified as Sudden Infant Death Syndrome (SIDS), nearly 50 percent of all sudden unexpected deaths of infants (SUID) are determined to be due to accidental suffocation or strangulation while sleeping, so they are preventable. Most sleep-related infant deaths take place in an unsafe setting like an adult bed or a couch or cushion. Here are some helpful safe sleep guidelines from giveyourbabyspace.org. Every sleep is different, so families should do as much as they can to build in these safe sleep practices and decrease the risks for SUID for bedtime and naptime. Make sure everyone taking care of the baby knows this information. Babies should always sleep on their backs, not their tummies or sides, EVERY time they sleep: naptime and bedtime. Babies should sleep alone, in their own sleep space, not together with an adult, child or pet. Babies should sleep in a safety-approved crib with a firm mattress and tightly fitted sheet, or a Pack 'n Play with a firm base. Never place a baby to sleep on a couch, sofa or recliner. Keep soft objects or loose bedding out of the crib. This includes pillows, blankets, bumper pads, stuffed toys and any clutter. Babies should sleep where their caregiver can see and hear them. Share a room with your baby if you can. Babies can lay or cuddle with you to breastfeed and bond, but when it’s time to fall asleep, or if you get drowsy, return them to their OWN sleep space. Babies should sleep in smoke-free homes, both where they live and where they visit. If you can, make it a rule that your home is smoke-free. Babies’ sleep spaces should be away from windows with cords that hang down from curtains and blinds. Babies shouldn’t overheat. Keep room temperature at what would be comfortable for a lightly dressed adult. If the room is cold, dress baby in an infant sleep sack right for their size and age. Car seats, swings and other furniture were not made for routine, extended sleep for a baby. Don't let the baby sleep in these devices for too long, and make sure you're keeping a close watch while they do.